Having a baby should be a joyous experience. However, complications can arise. Between 2 and 5 of every 100 women who give birth in the United States will experience a postpartum hemorrhage. Postpartum hemorrhage is defined as the loss of more than 500 milliliters (mL) of blood (about half a quart) during a vaginal delivery, and more than 1,000 mL of blood (a liter bottle of soda) during a caesarean delivery. Postpartum hemorrhage can be life threatening, so a quick response and a well-trained team are essential to ensure a good outcome for the mother. Postpartum hemorrhage has several potential causes, including vaginal lacerations, abnormal placenta attachment (known as abnormal placentation), and most commonly, the failure of the uterus to contract effectively after delivery. Abnormal placentation describes a placenta that is not attached to the wall of the uterus in a “normal” way. Some examples include placenta previa, where the placenta is low lying or covering the cervix, and placenta accreta, increta, or percreta, where the placenta attaches into the uterus more deeply than it should, or in the case of placenta percreta, extends outside the uterus. In these cases, the risk for hemorrhage is increased because the placenta is growing through more layers of tissue than normal. A placental abruption occurs when the placenta detaches from the wall of the uterus before the baby is delivered and can be life threatening for the mother and the baby. Once a baby is delivered, the mother’s uterus will continue to contract. These contractions assist in the delivery of the placenta – called the third stage of labor – and after that, the closing of the blood vessels that attached the placenta to the wall of the uterus. But if the uterus fails to contract effectively, called uterine atony, blood continues to flow freely, leading to postpartum hemorrhage. Atony essentially describes the fatigued uterine muscle, and because that muscle is tired out – often from a long labor or the use of Pitocin (a drug commonly used to induce labor) – its ability to contract normally is compromised. There are a number of other risk factors for postpartum hemorrhage, and at Beebe Healthcare, all moms are screened for risk factors when admitted to labor and delivery. Risk factors include a previous uterine surgery or caesarean section, obesity, and a history of previous postpartum hemorrhage. Other risk factors include complications such as preeclampsia or infection, having more than four previous births, carrying multiples, or having an overly distended uterus. How Do We Treat Postpartum Hemorrhage? Hospitals across the country are taking steps to prevent and treat postpartum hemorrhage with great success, and Beebe Healthcare is on board. The Council on Patient Safety in Women’s Healthcare has developed a patient safety bundle, or set of standardized guidelines, that should be used to prepare for, identify, and treat postpartum hemorrhage. This bundle is based on work done by the California Maternal Quality Care Collaborative (CMQCC), and the Alliance for Innovation on Maternal Health (AIM), which successfully cut California’s maternal mortality rate by more than 50 percent over a four-year period. The guidelines are broken up into four sections: Readiness, Recognition, Response, and Reporting. Readiness – To ensure readiness, a hemorrhage cart, which contains everything needed to treat a hemorrhage all in one place, is always ready to deploy as soon as a hemorrhage is identified. Another step is to practice what to do during a hemorrhage using simulation training. Recognition – All moms are screened upon admission, and again during their stay if appropriate, to identify their risk of hemorrhage. After delivery, blood loss is quantified, rather than visually estimated, so that as soon as a mom hits the identified limit, the team can initiate action steps to treat the hemorrhage. Pitocin is automatically administered during the third stage of labor (delivery of the placenta) to help the uterus continue to contract. Response – Beebe has developed a standard protocol for the treatment of obstetric hemorrhage, and has even developed a special code, Code Crimson, which is treated just like a Code Blue. This response ensures that all of the appropriate personnel are available to treat this obstetric emergency. Reporting – A perinatal dashboard allows us to look at our own data and monitor incidences of obstetric hemorrhage with the goal of reducing them. We also participate in a statewide initiative to reduce maternal mortality and morbidity through the Delaware Perinatal Quality Collaborative, and conduct a formal review of all cases of severe hemorrhage. Beebe has successfully used the 4 R’s to increase early identification and treatment of postpartum hemorrhage. Because we are identifying hemorrhages earlier, we are transfusing less quantity of blood, which means a better outcome for mom. Using the 4 R’s, which include employing best practices for prevention and treatment, we are making Beebe Healthcare one of the safest places in the state for moms to deliver their babies. Bridget Buckaloo, MSN, is the Executive Director of Beebe Women’s and Children’s Health. 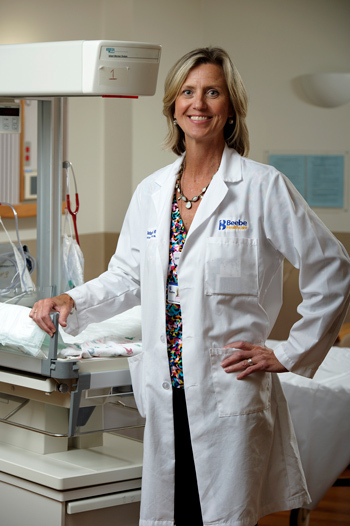 She has more than 27 years of perinatal nursing experience and previously served as Perinatal Project Coordinator with the Delaware Chapter of the Perinatal Cooperative and Delaware March of Dimes. Learn more about women’s healthcare at Beebe: www.beebehealthcare.org/womens-health. Talk to our Women’s Health Nurse Navigator about women’s health services at Beebe: womenshealth@beebehealthcare.org.